Children love the old trains at the Museum of Transport, while adults can admire the architecture and enjoy a night out on a Glasgow city break. 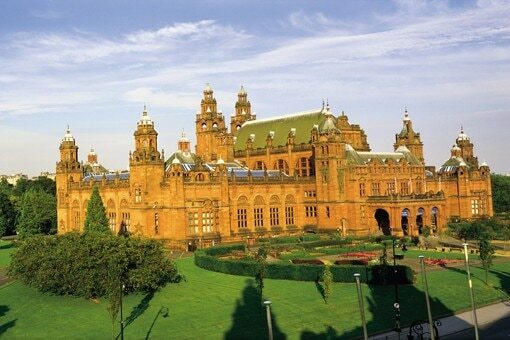 Book a Glasgow hotel and see the past and future faces of this vibrant city. As the largest city in Scotland, it’s no surprise that Glasgow boasts a buzzing nightlife. Live music lovers will be spoilt for choice with Glasgow’s gigs, while energetic all-night dancers will go wild in the neon-washed clubs. There's a stimulating theatre scene too. Despite having a reputation as a hard-and-fast party city with no end of cool clubs and bouncing bars, Glasgow is actually entirely family-friendly, offering no shortage of unforgettable days out with attractions ranging from lush botanic gardens to kid-orientated science centres. Glasgow isn’t just a leading Scottish city. With its seemingly limitless range of inspiring art galleries, mind-expanding museums, and grand, architecturally diverse landmarks, Glasgow has a firm footing on the world stage of cultural meccas. Whether you're wandering the momentous shopping malls, dining on hearty Scottish cuisine or having a nosey around its memorable museums, Glasgow has something for every traveller. With a modern, regenerated city centre and quayside – as well as a growing reputation as a tourist hotspot - travellers can find a spectrum of hotels to bed down in when visiting Scotland’s largest city. With the second largest retail centre in the UK, Glasgow is Scotland’s shopping capital. Whether you're after big brand names, luxury outlets or smaller stores, Glasgow caters for any budget or style. In the heart of the city is the "Style Mile", a district dense with independent boutiques, high street names and memorable malls, all within strolling distance. Refuelling is easy, with plenty of pitstops in the shape of Glasgow's lively cafés, bars and restaurants. Glasgow has undergone a cultural transformation over recent years – an evolution reflected in the array of high-quality eateries in the city. With wine bars serving pan-European treats and top-end restaurants championing modern Scottish cuisine, Glasgow is a culinary city on the rise. Thanks to an array of eateries dotted across the city’s streets, serving dishes from each corner of the globe, Glasgow is now one of the leading British restaurant cultures outside of London. Traditional Celtic music, a cosmopolitan café culture and underground rock gigs make up the melting pot of Glasgow nightlife. Book a Glasgow hotel close to this welcoming city centre. Located at the west end of Scotland’s central belt, Glasgow is fully stocked with ornate architectural splendour, stately old museums, and fine contemporary art galleries. There’s also a strong retail scene full of designer stores and quirky boutiques, ideal for the splurging shopper. Glasgow is also a cutting edge city when it comes to music, hosting endless live gigs and concerts from hip indie bands to classical folk outfits.